Home / Blog / Importance of 301 Redirects when upgrading your website. Basically, 301 redirects is a term where the Search Engine understand that a certain page is moved to another page, permanently. It helps the site owner to protect the older URL's data when upgrading, moving or redesigning to a new URL. Though this redirection is not a hard task to do, many website owners even web developers forget to about it. And as a result, all the SEO efforts go in vain and effects the ranking by wiping away all the data of the previous URL. To be honest, how many of us really care about 301 redirects as a part of the website design & web development? I have doubts. But there are thousands of questions flying around the Social Media, Forums about the ranking issue when a website owner moves to a new URL and the ranking drops. As I said earlier when a blogger or website owner thinks about remodeling, redesigning or moving a website to another URL, 301 redirects is a must to do. I am also afraid to say that, there are people out there who claims to be an SEO expert and totally don't aware of 301 redirects at all!. This really makes me angry and hopeless. As a result, I've decided to make a little bit of contribution to those expert Web developers and SEO experts. Today I'll talk about what 301 redirects is, what are its effects and how to do it. If you need to change any of the URL that is shown to the users and search engines, then Google recommends using server-side 301 redirects to redirect both the user and search engines to the right page. Though an average user won't notify the redirection, search engines will. In one word, 301 redirects is a status code that instructs the search engines that the page is permanently moved to a new location and guides it towards it. This redirects also orders the search engines to move all the SEO history to the new location and pushes the traffic towards it. When you have moved your old site to a new domain and you want to move all the SEO juice to the new domain. If the old website is redirected to a new domain, then all the old website's SEO traffic, history will be routed to the new domain. Without implementing 301 redirects, your new domain will act as a new domain. You need to change a certain page/post/product or category URL. But you want all of your existing URL's SEO juice and *Page Rank transported to the new page/post/product or category URL. When merging two websites and you want to the links of the outdated URLs are redirected to the correct pages. *Page Rank: It’s simply a number from 0-10 which is assigned by Google. This number is an indication of how good your overall SEO is for a given piece of content. But Google has decided to remove the Page Rank service since April 2016. Obviously, there are many ways to set up 301 redirects. Some are for the developers and some are for basic amateur end users. Generally, there are two methods largely used to set up 301 redirects into the website. In order to do 301 redirects on a site that is hosted by Apache server, then you'll need to have access to the server's .htaccess file. For non-programmer person, this part would be a no-go. 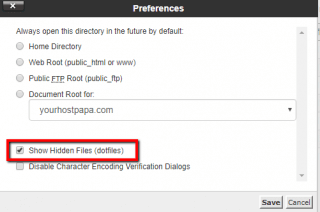 Go to your HostPapa cPanel. In the Files section of the cPanel, click File Manager. The File Manager opens in a new tab. Click the Settings button at the top right. In the Preferences window, check the Show Hidden Files checkbox. Click the Save button. The File Manager window now shows all files, including hidden ones. In the Files panel, double-click the public_html item. The contents of the public_html folder now display. This is where your .htaccess file will live. For a new site, there isn’t a .htaccess file yet, so you’ll need to create it. Click the +File button at the top left. 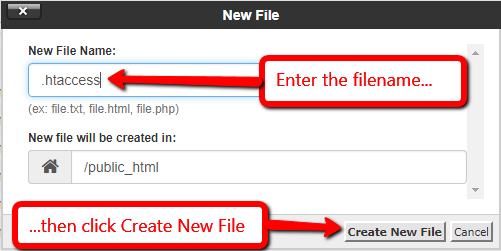 In the New File window, enter the filename as .htaccess and click Create New File. The .htaccess file appears in the list. Click once on the .htaccess file to select it, then click Edit. 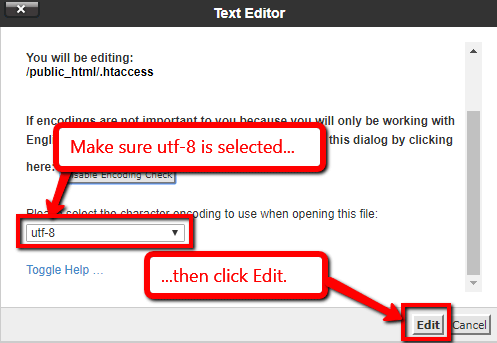 In the Text Editor dialogue box, scroll down and make sure utf-8 is selected. Then click the Edit button. The text editor opens in a new tab. The window will be blank since it’s a new file. Enter the page or domain name redirect code as described above. When you’re done editing the .htaccess file, click the Save Changes button at the top right of the Text Editor window. Repeat for every page you wish to redirect. If you are a WordPress user, then WordPress is born to ease your life. There are many plugins for this operation but my personal favorite is Redirection. It offers you to add the new link right in the dashboard. This plugin is really easy to work with for any Website or Blog owner. Pingback: Supreme Supports | 6 Small Bedroom Ideas To Fall in Love With!